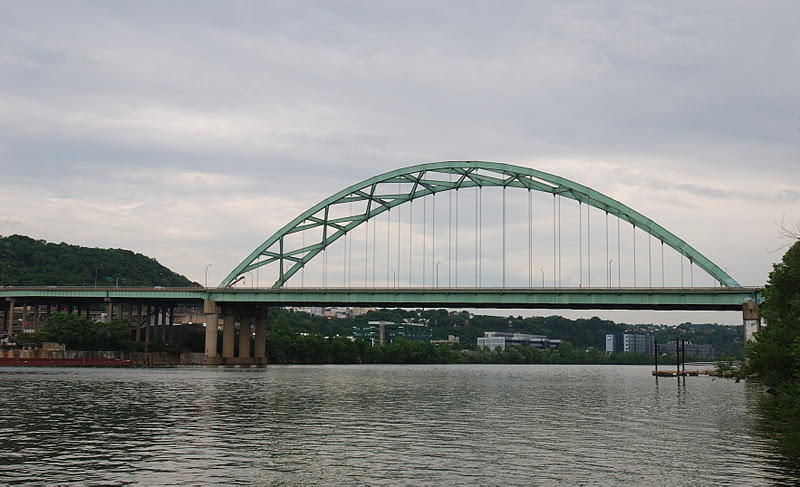 The Birmingham Bridge is a 1662 ft (507 m) long viaduct with a 607 ft (185 m) steel, bow string arch over the Monongahela River. It has six traffic lanes and one pedestrian walkway. It was built in 1976, just downstream from the Brady Street Bridge, which it replaced. This bridge was built to be part of a beltway through the city that never happened. To the south, it is a six lane expressway with lanes that end abruptly. To the north, it crosses the Penn Link Parkway without any connector ramps. It's also had a few structural problems. In 2008, one span of the bridge came off its bearings and fell onto the bent cap. Pittsburgh's Bridges: Birmingham Bridge by Mark Yashinsky is licensed under a Creative Commons Attribution-NonCommercial-ShareAlike 3.0 United States License.